Mexico | Retired and Lovin' it. I’ve switched over to PowerDirector for my video editing and I’m quite pleased with the software. So far the software has had every feature I’ve wanted while editing video and it is easy to use. It’s crashed on me a few times. PowerDirector is not happy loading 60 AVI files. It may load them, but it will crash trying to do much of anything. It looks like the software loads features as they are needed and does not have sufficient memory when a number of large files are loaded. The solution is not to do that! Just work on a smaller set of files and it runs just fine. While working on an entirely related issue (getting Amazon Prime to run on my smart TV), I would up connecting my wifi enabled devices to the TV. While testing the connection, up popped some video from our March whale watching trip. That was just the nudge I needed; editing those videos is a perfect way to test PowerDirector. The process went smoothly and without a crash. I’ve uploaded the mp4 output to the Loreto video album. The video was shot with a Canon IXUS 800 point and shoot in a waterproof housing. 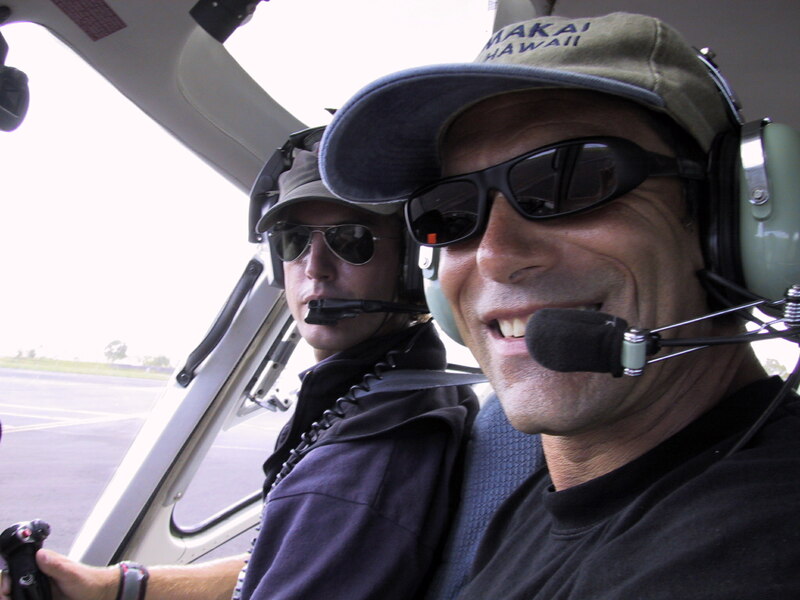 This was our first whale watching trip and we were concerned that better equipment could be irreparably damaged. The quality of the video is what you’d expect from an older point and shoot camera, though the IXUS 800 is a fine camera within limits. As for the video, it’s a sequence of our best clips of our days at Magdelena Bay, edited, spliced together, and with a sound track. I’ve kept the audio track in place, we get pretty excited. This entry was posted in Mexico, places We've been on August 10, 2015 by up4air. Finally! I’ve posted the first video of our trip to Loreto and Magdelena Bay of March this year. This was our first whale watching trip. I had my whale watching preconceptions blown away. This trip was very well organized (thank you Cynthia) and the boat operators were excellent. The food and accommodations were both quite good. 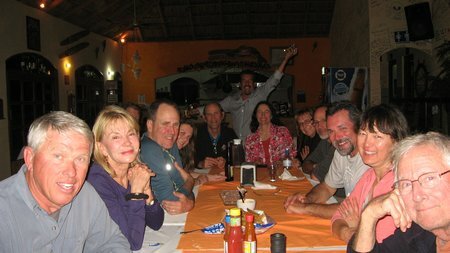 Here’s a photo of “the crew” and the owner of the restaurant and villas at Magdelena bay. The owner is a kick, he had us all dancing with the kitchen crew after serving us all a shot of tequila. I’m only now posting the video after “rediscovering” them while testing wifi connectivity between home devices and a smart TV. One of my PCs connected to the TV and started showing videos from Magdelena Bay. Ellen and I were transfixed and transported right back to Mexico. In March the gray whales calf. The males are long gone, but the females stay in protected bays to teach their calves how to be a whale. 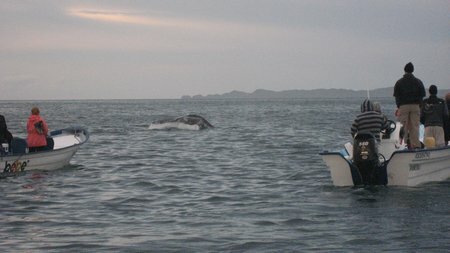 Almost every time we spotted a gray whale, she was with a calf. There was one solitary whale that we came upon multiple times. We called her “white stripe” because she had a distinctive white marking on her back. Unfortunately, on the way back to Loreto from Magdelena Bay I got terribly sick. Some others in our group came down with something similar and to a greater or lesser extent. We have no idea which food or drink might have caused the problem. It seemed entirely random. Everyone shared everything pretty much and no one item seemed to be the culprit. Was I very careful with food and drink? Not really. Would I do it all over again? Oh YEAH! Larry and Barb went fishing a few times and brought back a ton of fish that the staff at the Giggling Dolphin cooked up for us. It was gooood. I was “sick as a dog” (wonder what that actually derives from) on the day I planned to go with Larry. We had fun, met a bunch of great people, and have some fond memories of “it all”. Yogie stood amidships the entire day for days on end. Yogie’s a nickname Larry gave Steve some time ago. We will enjoy returning to Loreto and Magdelena bay over the next few years and rekindling some memories. This entry was posted in Mexico on August 9, 2015 by up4air. 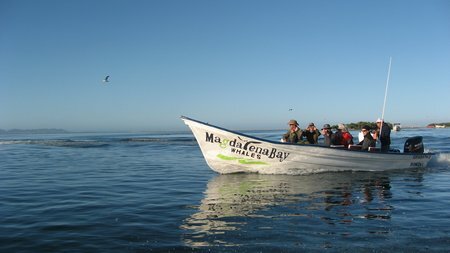 Ellen and I joined friends on a whale watching trip to Baja California Sur, Mexico. We are good friends with four of the couples having met for dinner often and taken outings to the wine country and hiking trips over the past decade (longer for Ellen). The other two couples quickly became friends of ours as well. The trip was fun. We enjoyed the camaraderie of banter over dinner, good food, and cervesa. We flew into Loreto, Mexico and drove to Puerto San Carlos on Magdalena Bay in two vans. Loreto is surrounded by a mountain range. It took two hours to drive from the Bay of California to Puerto San Carlos on the pacific side. Cyn pointed out that this is a relatively short drive. On last year’s whale watching trip it took six hours to drive north to their destination on the Bay of California! 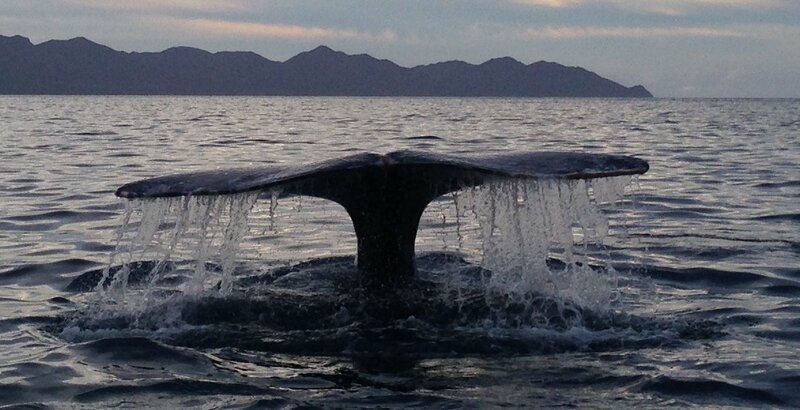 This is the time of year that the whales calf in the Sea of Cortez. We went to see the mommy and baby whales, both gray and blue. The two hour drive to Puerto San Carlos went by very quickly and in no time we were settling into our rooms. The rooms at Mar y Arena Eco Hotel are large and tiled with a sliding glass door facing Magdalena Bay. Each casita was two story with one room downstairs and one upstairs with a total of about six casitas in all. For us, the accommodations were quite comfortable though hot water was in short supply. Two took two full days from sunrise to nearly sunset at Puerto San Carlos. We had a fabulous captain who did not crowd the whales and let them come to us. Sadly most whales didn’t come to us, though a few came close. We did drift over the tail of one gray whale and have some great video of that. We also had a baby swim alongside and we touched the whale. We then drove back to Loreto for the blue whales. I got terribly sick on the drive back to Loreto. That put me out for two days. Some of our group did go out to see the blue whales. They are huge and the boats would not get close to them. “They are so big, you only see part of them at a time. They look like a huge log on the water”. They’re far less exciting to see than are the gray whales. I wanted to go fishing from Loreto. Larry and Barb went fishing two days and caught “yellow tail”. Not yellow tail tuna, but another fish that’s pretty good eating. The Giggling Dolphin cooked the fish for our group for a few nights. Had I not been sick, I would have been out fishing too. This was BIG FUN. Ellen and I will return next year, though we’ll probably opt for the 6 hour drive to the “friendly whales”. This entry was posted in Baja, places We've been on March 19, 2015 by up4air.